Russia may have just banned all of its national casinos, but that hasn't stopped ETF investors from gambling on the nation. The Market Vector Russia ETF Trust (RSX - commentary - Trade Now) has experienced a rally in recent months, but it is still a very volatile investment. The most recent moves by the Russian government seek to make the nation more economically stable. Last Saturday, The New York Times reported that the economically distressed country was making good on the threat by Prime Minister Putin toward its national casino industry. Starting immediately, the government is demanding that every legal gambling facility be removed from the country in an attempt to make the country "clean" of vice. Aside from the loss of 400,000 jobs, the cost of the anti-vice plan is estimated to amount to $1 billion in lost tax revenue. Because the plan seemed so far-fetched when it was first proposed, many failed to plan appropriately and are now facing tough choices. All of this comes at a time when the Russian government is seeking to add stability to the country's economy. Late last week, word had surfaced that the nation was in talks to put together a bank bailout rivaling that of the United States. Igor Shuvalov, the deputy prime minister of Russia has considered taking a stake in the nation's biggest banks to recapitalize the problematic system and protect it from nonperforming loans that currently make up a large portion of its balance sheet. Moody's(MCO - commentary - Trade Now) andStandard & Poor's warn that it could cost the nation as much as $40 billion this year to get the banks running again. If the proposed bailout does go according to plan, however, the government predicts that banks will be able to lend again in 2010. Russia's government has taken some serious steps in the past few weeks to get its economy moving. However, investors may want to be careful jumping in as the government's decision may cause trouble for the country's markets. RSX may see bright times in its future, but investors should be prepared for some uncertain moments if they try to cash in. Meanwhile, even if the Russian casinos are gone, that doesn't mean the country is vice-free. Smoking and alcohol consumption is still as present as ever in the nation. Investors looking for a taste of these and other guilty pleasures can look no further than the aptly named Vice Fund (VICEX - commentary - Trade Now) to add a little sin to their portfolio. I out lasted everyone last night. We played until 2:30am, until there were only 2 men left with chips. Everyone else busted out or cashed out. I didn't lose.... I only made $40. Kyle chased his flush with K7 and took down a big pot from me. Luckily, I made a good fold on the turn and built up my stack back after we switch to Omaha, when we were 5 handed. I had pocket Kings like 4 times and Jacks like 3 times. I hit one set of Jacks. Here is Bernake getting grilled by Congress. Ken Lewis, CEO of Bank of America said 2 weeks ago that Bernake and Paulson indirectly threaten him to go with the merger of Merrill Lynch or be fired. Bernake is responding to the accusation and he tries to deflect the charges. To me it is obvious that the threats were made, but not directly and this is proof that government is having way to much control into the private sector. I played for an hour and 45 minutes on Friday night. I made $210 or about $120 per hour. Not to bad if I say so myself... I wasn't going to play this weekend, I had someone coming over for the the weekend, but had a couple of hours to spare. So I figured I would burn some time and play a little. I only bought in for $150, thinking I didn't want to lose to much. That turned out to be a mistake after my first big hand. It was 10 minutes into the game and I have pocket 44s under the gun. I limp in and the small blind, Zane, rasies to $12. I call and everyone else folds. The flop is A45. Zane bets out $15. I re-raise to $45. The turn is a 9 and Zane checks. I bet $50 and he check-raises me all-in for my remaining $46. Zane says, "I guess you hit your set.." The river is a Queen and he shows 2-pair. German, sitting next to me, says yeah that's what I put you on... And they were right.. my set of 444s takes it down... My stack goes to about $250. A few hands later I get AQ and limp in. The flop is A,10,A. The big blind bets $6 and I re-raise to $15. The turn is a 7 and he checks. I bet $25 and he calls. The river is a rag and he checks. I bet another $25 and he calls again. I show my big Ace and he never shows.. Another nice $125 pot for me. My stack is now over $350 and I have only been playing for 1.5hrs. A few minutes later I get pocket 10s on the button. Ireland calls my $15 pre-flop bet and $30 flop bet. The flop was Jack high. I check to the river and he had nothing, just AK. Unfortunately, I have to leave shortly after. I never hit and run, as they say. I am the one that stays for 12hrs at a time, but I had someone waiting. It did feel good to make my goal for the weekend and go home a winner again. It was a good weekend of Poker for me. Friday night I made $345 and Sunday I made $85. It was slow and steady and all my hands held up pretty well. I was always ahead and stayed ahead. It's nice to have sessions like that. My sets came back with vengeance. Hitting a set of 777s, Kings, eights. I would have made quads with pocket 44s, but I folded to a $25 pre-flop raise. I hate when that happens, I should have played my heater run, but I cant complain to much. I made money this session. I decided to venture out last night for a quick round of Poker. This past weekend was not a good session. I managed to lose $430. I made one bad read and that wiped me out. I had to get back in the game and get my confidence back. So I went to the Palms and they did not have enough players. I had their famous chicken fried rice and headed out to the Mobile. My first hand dealt was pocket fives. I limped in and a guy next to me raises to $20 and 3 others people called. I didn't hit a set and folded on the flop to the continuation bet. 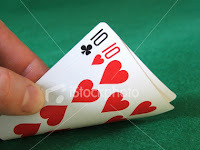 A few hands later I have pocket 10♣,10♥. The small blind raises it $30. One other guy calls. The flop is 6,9,10. I just hit top set. The small blind checks so I bet $65 and everyone folds.. Wow, I haven't hit a set in forever.. I had thought I forgot how..
Then I get pocket Aces under the gun. I raise $20 and get 3 callers. The flop is Jack high and the small blind bets $50. I push all-in for around $150. Everyone folds and I take it down. A few hands later I get pocket Jacks. One guy raises to $15. I put him on a big Ace. So I figure I would smooth call and hope no big cards hit. Well, 3 people call after me and then a guy pushes all-in for $70. The pre-flop raiser decided to call and I think a moment and also call. This makes everyone else fold. The flop is 347. The pre-flop raiser checks so I push all in for $155. He thinks for a while and calls! The pot is now close to $700. The turn is a 5 and river is a 6. Their is a straight on the board! The all-in guy had pocket 10s, the raiser had AQ and I had Jacks. But we all split the pot!!! Sick hand... That should have been all mine! Then the hand of the night. I am on the button with pocket 8♣,8♥s. Under the gun guy raises to $10. Five people call including me. The flop is A♥, 8♦, 3♦. The pre-flop raiser bets out $25. I re-raise him to $100. He pushes all in and I call. The guy has A8. My set takes it down and I double up to over $600. All this happens, within two hours of play. I consider this pretty lucky so I pay a few more hands and quit a winner.. I decided to go play poker on a Thursday work night. It is a Round by Round game. A round of Hold'em then a round of Omaha. The action in Omaha is much bigger compared to Hold'em. The hands combinations are just that much higher. Typical winning hands are straights and flushes, with more full houses and quads showing up then in Hold'em. The bad beats are very common. Set over Set is the norm in Omaha, so you better have top set. Anyways, I was just bored and wanted to make a few bucks. I treaded water for a while and finally hit my hand with a new guy at the table. It was in an Omaha hand. I had K♥, K♦,7♦,10♥ or in Omaha poker terms I had pocket kings double suited.. I raised to $10 and had 2 callers. The flop is 8♥,2♦,3♦ with 2 diamonds. I flopped a flush draw and bet out $30. Ashely folded and the guy called. The turn was a Jack of ♦ Diamond. I check, in case the guy turned the nuts. He bets the pot and I figure he is trying to bluff me. I go all-in and my second nut flush and it is good, the guy was bluffing. I have been playing at the same place for a while now and have started losing a little. Losing in Poker is really just part of the game. I wasn't playing bad, I just had some bad beats and people getting really lucky on me. I know it should not last forever, but I figured I would try a new place. I did some searching and found this place in Downtown. The game has only been running for a month and is run by Jason he owns a huge online poker tracking system of Poker players. 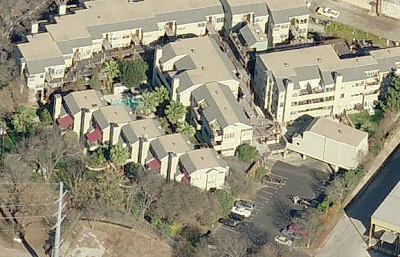 It is located in a really nice area, right by the water in Downtown. The game started out slow for me. It was a steady losing session. I got down to $40 when I finally got pocket Aces. Julia Park had raised in front of me $20, so I pushed all in for $40. Julia had pocket 88s and my Aces held up. Then 10 minutes later I get Aces again. I raise to $15 and Julia calls saying, "I have my favorite hand.." and Jason calls. The flop is Jack high. I bet out $40 and the girl instant calls and Jason folds showing someone his hand. The turn is a rag and I go all in for $21. The girl calls. She has "everyone's favorite hand" J10. My aces hold up again. Jason also had J10, good laid down... Now I am doubled up again to $160... Played a little bit more and made a few dollars more before the game ended. I only loss $37 for the 5 hr session. I consider it a minor victory for getting nothing for hours..